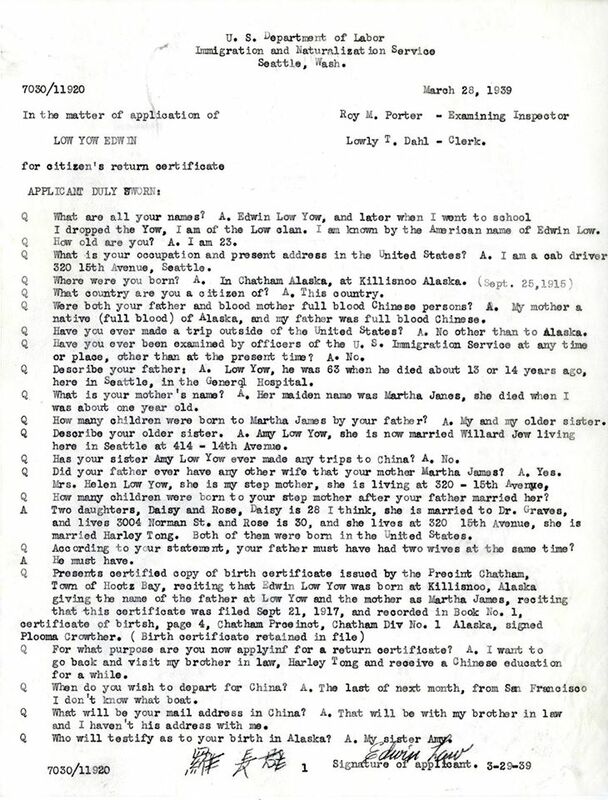 “Application for Citizen’s Return Certificate, Form 430,” 1941, Chinese Exclusion Act case files, RG 85, National Archives at San Francisco, Bruce Lee (Lee Jun Fon) case file, SF file 12017/53752; https://catalog.archives.gov/id/5720262, image 8. Bruce Lee (Lee Jun Fon) was born on 27 November 1940 in San Francisco, California. 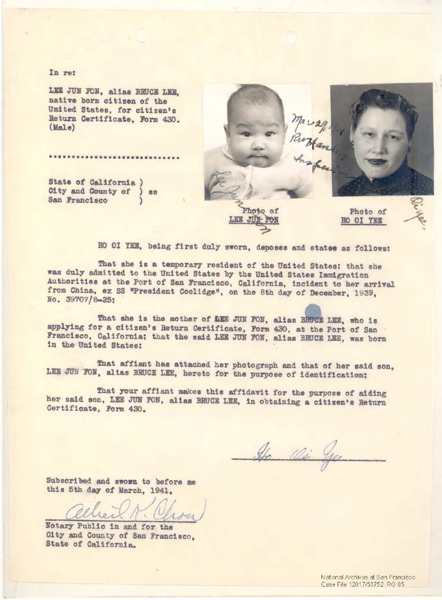 In order to establish his son’s right to his United States citizenship and before the family returned to China in April 1941, his father, Lee Hoi Chuen, filed a Citizen’s Return Certificate on his son’s behalf. This would document his son’s birth, his American citizenship and enable him to return to reside in the United States at a later date. His father was an actor at the Mandarin Theatre in San Francisco; he was 27 years old and was born in Fat San City, Nom Hoy, China. He testified that he and his wife, Ho Oi Yee, were married ten years and had four living children—one son died in Hong Kong and one daughter was adopted. Ho Oi Yee’s mother was English. Lee Jun Fon (Bruce Lee) was the only child born in the United States. The doctor gave Bruce Lee his American name. His father couldn’t pronounce it but went along with it. 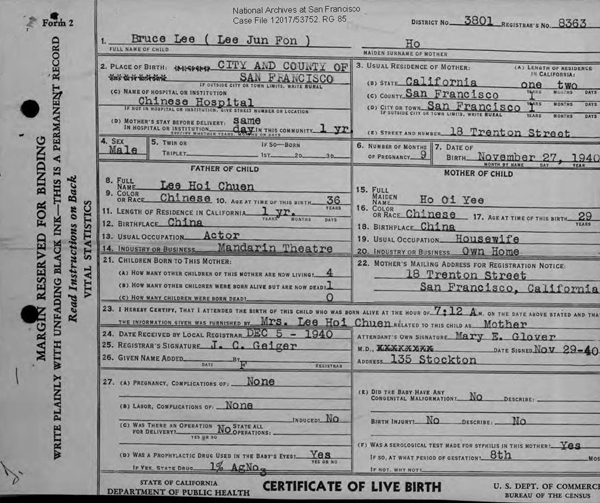 Bruce Lee, SF file 12017/53752, corrected birth certificate, image 23. 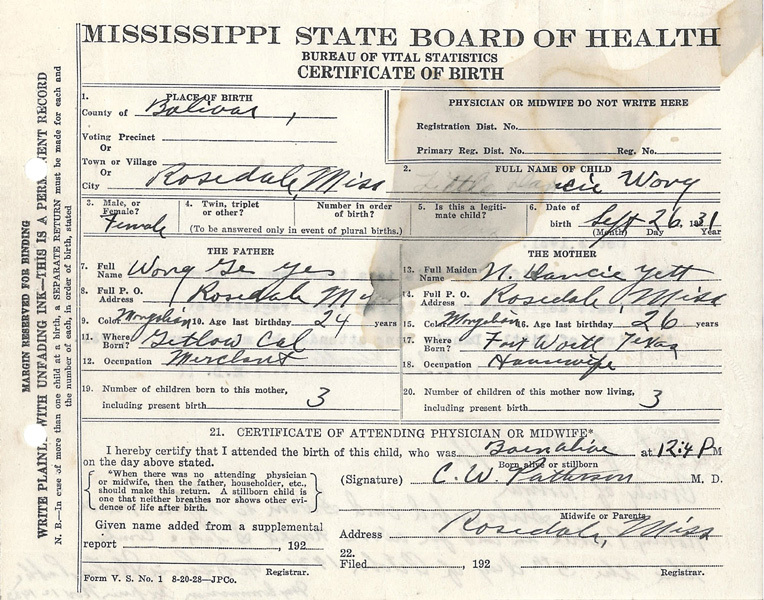 A copy of Bruce Lee’s birth certificate and a corrected copy are included in the file. 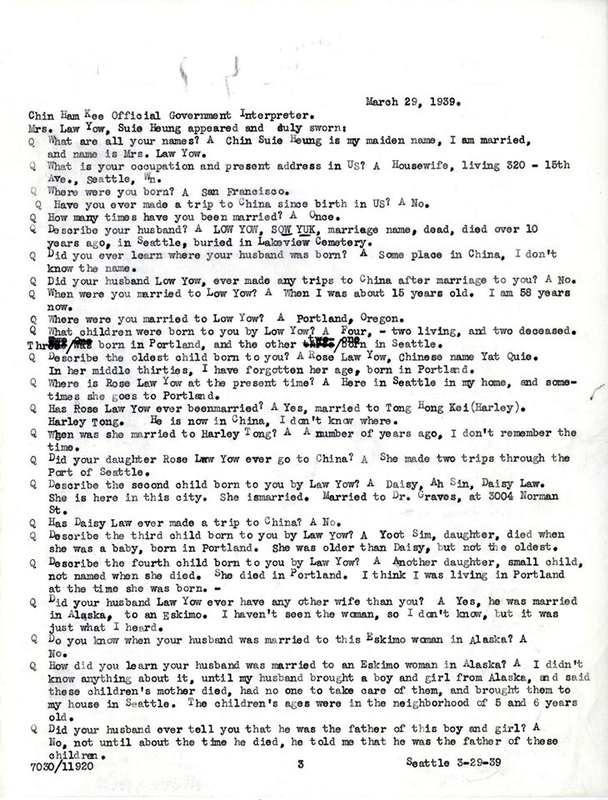 In the original document, Item 3B stated that his mother’s usual residence was China. This was corrected to say that she had been a resident of California for one year, two months. Leong & Co. Store Photo, 1923, Chinese Exclusion Act case files, RG 85, National Archives-Seattle, Leong Hoey file, Seattle, Box 950, Case 7032/2037. According to a newspaper article included in the file [Oregon Journal, Portland, Oregon, Nov, 11, 1923, p. 1, col. 1] a gang robbed the store and shot, Leong Hoey, the proprietor, early in November. Judge Stapleton sentenced C. H. Jackson, leader of a gang, to ten years in the penitentiary and Vito Dellino received a 2-1/2 year sentence. 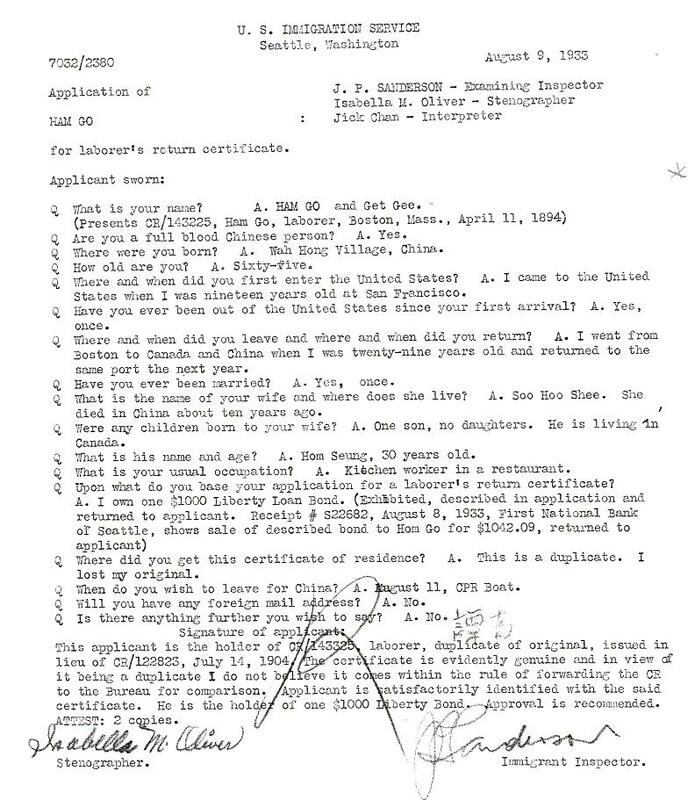 In October 1932 Leong Hoey [sometimes spelled Huey or Houie] applied for a laborer’s return certificate. He owned a $1000 Fourth Liberty Loan Bond, worked in a fish cannery, was married, and had a son, See Gok, who was 8 years old. 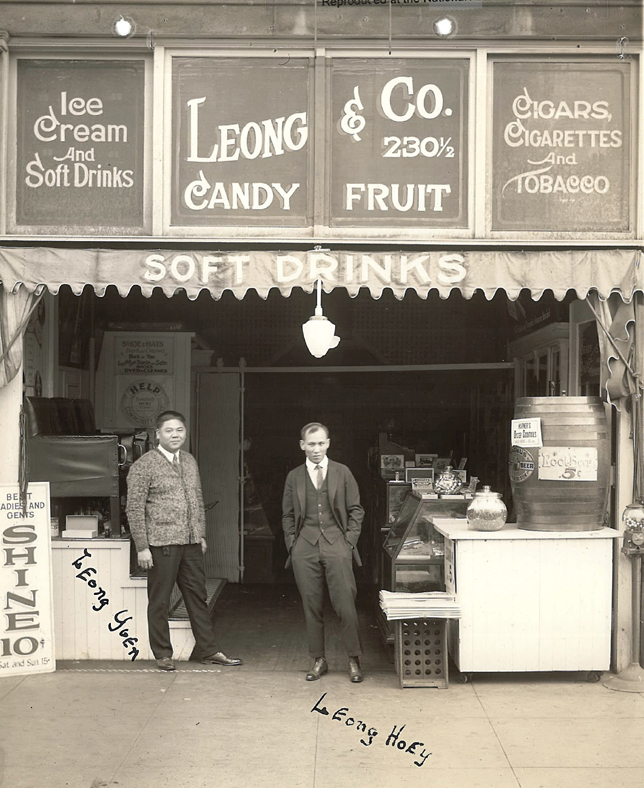 Leong Hoey arrived in the U.S. in 1910 and was admitted as the minor son of a merchant. His file also contained a letter from his brother, Leong Yuen, answering a charge by the city Attorney that the store at 230 1/2 had been used for gambling. He explained that the rear of the building had been leased to a Chinese society to be used as a meeting place. Leong Hoey’s application was denied. He appealed and it was approved. He left for China from Seattle on 7 October 1932 and returned the following year. Jick Chan [James Jick Chan] was a Cantonese translator/interpreter for the U. S. Immigration and Naturalization Service in Seattle for many years. The obituary for his son, Warren Chan, who died in Seattle on 15 June 2015, mentions his father’s service. 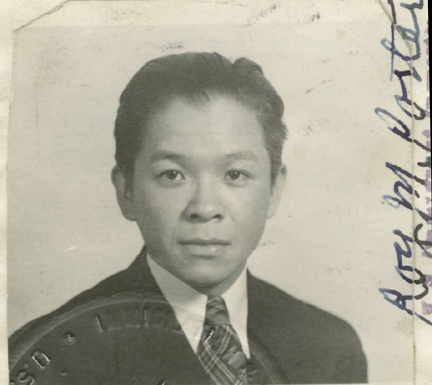 See Obituary: “Former judge Warren Chan, 92, Wing Luke Museum co-founder” for more information on the family. Warren Chan’s obituary appeared in The Seattle Times on Monday, June 29, 2015, page B1 & B2.